Michigan’s offense is not all that good, which makes this question easy to answer. Penn State has a terrific defense that leads the country in fewest points allowed (just 9.0 per game) and should play well Saturday night. But even if it doesn’t, the Wolverines don’t have the kind of dynamic offense that will blow up the Nittany Lions’ defense. Michigan does have a fantastic defense, though, so Trace McSorley, Saquon Barkley and the PSU offense will have to be on top of their game. The offensive coordinator has proven to be an excellent playcaller in his two seasons at Penn State, and he will have a stern challenge dialing up the right plays against a fast, strong, talented defense that has the ability to totally shut down a team. Michigan will attempt to do what most teams try to do against PSU, and that’s stop Barkley on the ground. The Wolverines are capable of doing that, too, because of their strength up front defensively, and because they’ll be going up against a Penn State offensive line that has been a disappointment so far this season. That’s where the pressure will fall on Moorhead to mix and match the playcalling and try to look for matchup advantages. Running Barkley up the middle probably isn’t going to work, and sometimes Moorhead stubbornly continues to do that, even when the star running back has shown he can be more effective going around the edge. Barkley is the best player in college football, but truth be told, for PSU to win this week and next week against Ohio State, McSorley will be the key. The quarterback’s decision making on run-pass options and accuracy throwing the ball will have to be on point for the offense to consistently move the chains. 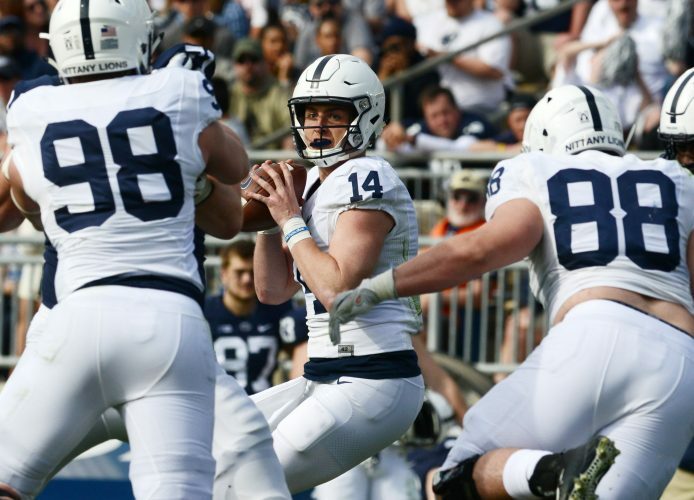 As I’ve been pointing out for weeks, Penn State has not been connecting on the 40- and 50-yard passes that made scoring TDs quick and easy last year, so it comes down to being more steady from play to play and not making drive-killing mistakes. PSU’s offense had a bad day last year at Michigan (10 points, 12 first downs, 191 total yards), but that seems like a lifetime ago. Moorhead’s system is now in place, and even with a mediocre O-line, there are so many weapons on offense that we should expect the Lions to have a much stronger showing this time around against Michigan. They’ll have to in order to win.